Keurig K15 Personal Brewer Only $38.83! Down From $110! You are here: Home / Great Deals / Christmas Deals / Keurig K15 Personal Brewer Only $38.83! Down From $110! Sears has this Keurig K15 Personal Brewer on sale for $74.58 (Reg. $110) but you will get back $35.75 in Shop Your Way points, making it $38.83! Classic Series Keurig K15 Black.The Keurig® K15 brews over 500 different K-Cup® pod varieties from 75 brands including Green Mountain Coffee®, Starbucks®, Lipton®, and more. 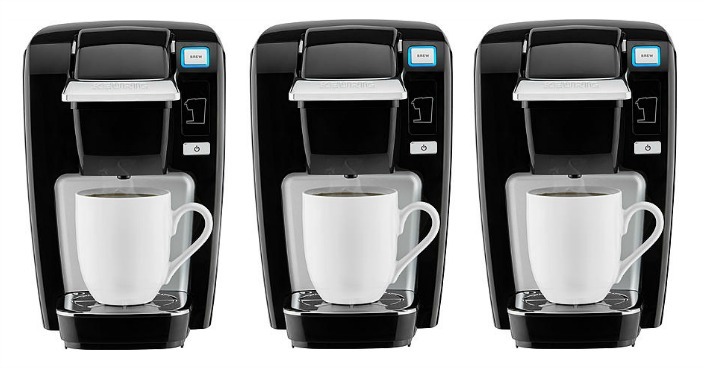 Enjoy coffee, tea & hot cocoa at the push of a button with the quality you expect from Keurig. When space and portability are important, choose the Keurig® K15 personal brewer. Product Features:• Brews coffee, tea, hot cocoa, specialty and iced beverages.• Brews 6 oz., 8 oz. and 10 oz. sizes.• Brews in under 2 minutes.• Cord storage.• Removable drip tray.• Auto off after 90 seconds.• Compact size. Final: $38.83 PLUS FREE in-store pickup or FREE in-store pickup on orders over $49! !